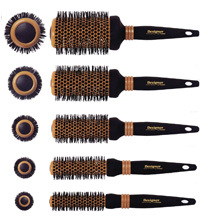 These brushes are equipped with ceramic coated barrel, with antistatic effect. They work with negative ion technology. Their drum is perforated and treated with an inert material that retains most of the heat releasing more evenly. It tolerates high temperature peaks perfectly thanks to its thermal resistance, the ring provides excellent grip and the rubber handle makes it soft and manageable. Available in diameters of 30, 40, 50, 60, 70 mm.